1935. Pedestrian bridge in remote location over the River Ythan; 9-span beam and slab construction; shallow catenary curve form. Reinforced concrete. 8 broad, slightly battered piers with plinths (chamfered to top); balustraded parapet with square balusters; solid parapet section above centre span to both sides; square piers to ends of parapets. To SE parapet (to centre of bridge, facing footpath), bronze WWII memorial plaque dated 1946; to NW parapet (to centre of bridge, facing footpath), bronze Great War memorial plaque, dated 1935. Auchmacoy Memorial Bridge is a striking example of the use of reinforced concrete in a remote rural location, connecting the villages of Logie Buchan and Auchmacoy. Its significance is amplified by its unusual status as the parish War Memorial, with two brass plaques recording those who fell in the First and Second World Wars. Auchmacoy Memorial Bridge is situated at Boat of Logie, where until the bridge was built, a ferry was used as the only means of crossing the river. On the north bank is Ferry Cottage (not listed), formerly known as the Boathouse, a reminder of this earlier means of crossing. 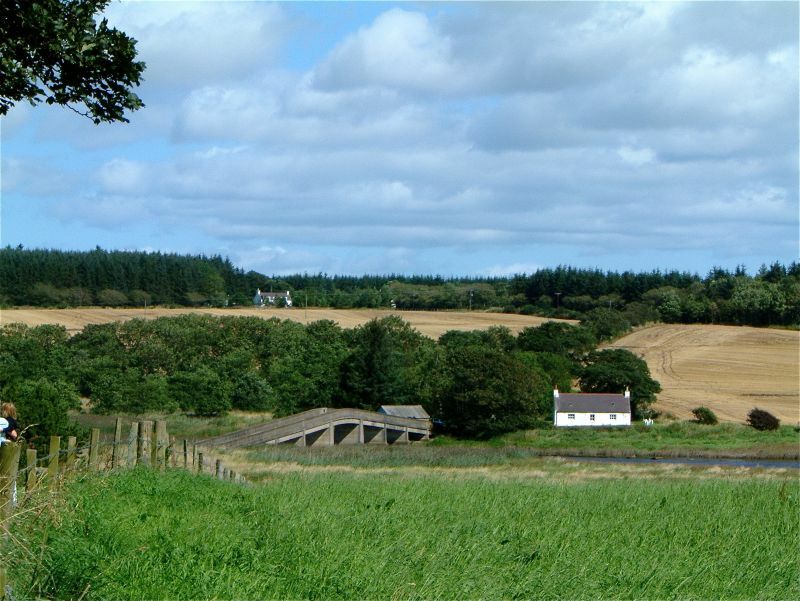 In the 1820s the parish of Logie Buchan first seriously considered the construction of a bridge over the Ythan at this point. However, no action was taken until 1891, when the Kirk Session received a bequest of £35 from Miss Mary Cruden, 'for behoof of the parish as maybe considered most beneficial'. Miss Cruden's sister suggested that the money should 'be appropriated for any scheme that may be set on foot for the erection of a bridge at Boat of Logie'. In 1919, the funds stood at £700 and a bridge and war memorial committee was formed, with Lord Caithness as chairman. Thirteen years later, in 1934, the funds stood at £3000, and bridge building could commence at last. 'A fine concrete bridge was built, a great achievement for a small community, and the opening ceremony in 1935 was an outstanding event in the history of the parish'. (Third Statistical Account). C Mission Hall and House, Denhead, Auchmacoy.